Home ☢ Giveaways ☢ Enter to win SGT. STUBBY prize pack: A great stocking stuffer for kids! Enter to win SGT. 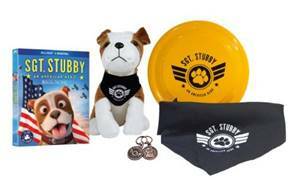 STUBBY prize pack: A great stocking stuffer for kids! The new animated movie SGT. STUBBY: AN AMERICAN HERO has been released on DVD and Blue-Ray this week. The story of the most decorated war dog in American history has been awarded a Dove Foundation’s “All Ages” Seal of Approval and Parents’ Choice Gold Award. I am very pleased to partner with Paramount to give away a SGT. STUBBY prize pack. It’s the perfect stocking stuffer for kids of all ages and includes a copy of the film on Blu-Ray plus an adorable Sgt. Stubby plush toy. Use the Rafflecopter below to win! E.T. is one of my favorite family films. One of my favorite family films is “Big” with Tom Hanks. We have a lot of family favorites. Most of them are the dog movies like Santa buddies and such. My favorite Family film is Toy Story. It was groundbreaking in so many ways. I’ve always enjoyed the Toy Story movies. My family really enjoys watching them.